Kit no. 6019 "1939-1945 series"
DML Dragon is a prolific model company based in Hong Kong, China. They make all manner of model subjects in the popular scales. 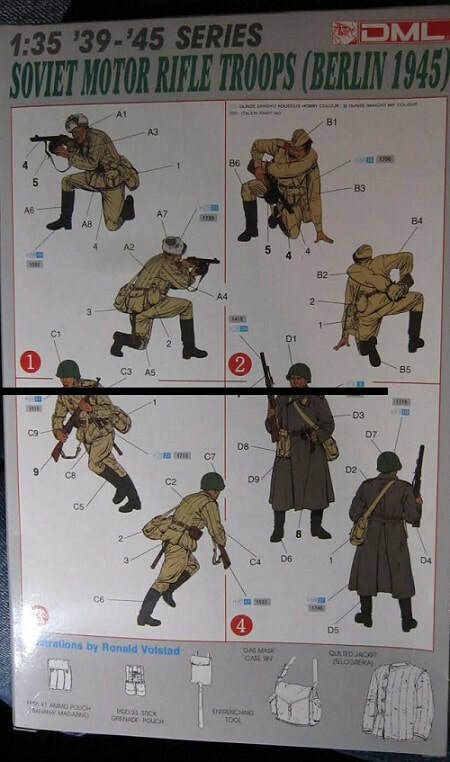 The box art shows 2 Motor Rifle Troops kneeling on top of a Soviet tank, a 3rd troop running and a 4th just standing. The 2 troops shown on top of the tank are wearing khaki uniforms consisting of quilted jackets (telogreika), and pants tucked into black jack boots. One wears a wool hat and the other wears a cloth side cap. Both are armed with PPSH machine guns. They each have a canvas gas mask case "BN" slung over their shoulders and a canteen on their belts. The 3rd standing troop is wearing a long winter coat. He has black jack boots and wears a steel helmet on his head. He is armed with a Mosin-Nagant repeating rifle he has a leather pouch on his belt and a canvas gas mask case slung over his shoulder. The 4th and final troop that is running wears a quilted jacket. He has a steel helmet on his head and black jack boots. He has the gas mask case on his shoulder and a couple RGD33 stick grenades on his belt. He is armed with the Mosin-Nagant repeating rifle. One corner of the box art says that the kit is intended for modelers over 10 years of age and that it contains 50 parts. One side panel has 3 color box arts of other kits that DML markets: kit no. 6011, a German super-heavy "Maus" tank, kit no. 6018, a Soviet JS-2, ChKZ production type and kit no. 6021, U.S. Rangers (Normandy 1944). 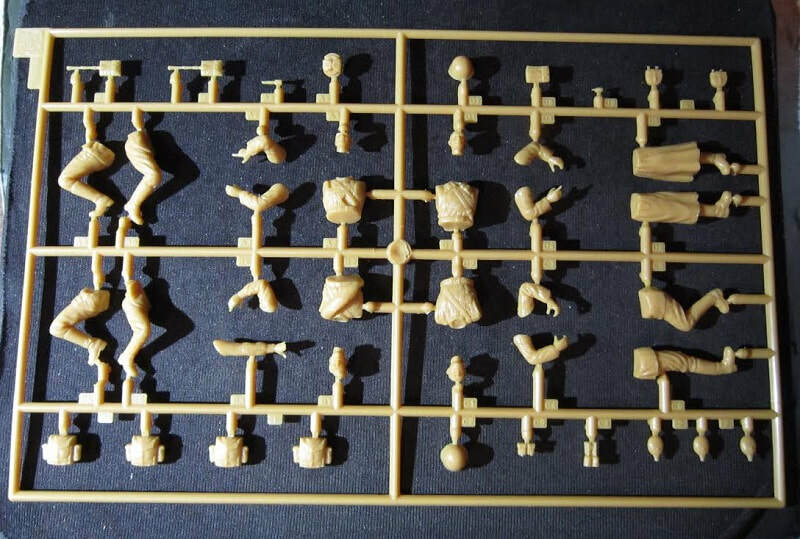 ​The other side panel says the kit contains parts for 4 figures and that paint and glue are not included. This is followed by Marco Polo Import, INC's street address in City of Industry, Ca. They were the U.S. importer of DML kits in the 90's. Their FAX number is also supplied and the copyright of the kit is 1994. The kit was made in Hong Kong, China. The bottom of the box serves as the assembly and painting instructions. There is 2-view in color of each of the 4 figures. Below these is illustrations as black and white line drawings of: a PPSH 41 ammo pouch ("banana magazine), a RGD 33 stick grenade pouch, a entrenching tool (shovel in its pouch), a gas mask case "BN" and a quilted jacket (telogreika). The kit contains one large light-tan tree and a small light-grey tree. The large light-tan tree holds: the parts of the figures (divided into separate heads, torsos, legs and arms. There are 3 canteens, stick grenade pouch, ammo case, 2 steel helmets, a wool cap, 2 shovels in their carrying cases, 4 gas mask cases, pouches etc. (43 parts). ​The small light-grey tree holds: 3 PPSH 41 machine guns, 2 snail drums of ammo for the PPSH, a captured German MP40 sub machine gun and its wire folding shoulder stock and a captured German MP44 assault rifle (11 parts). 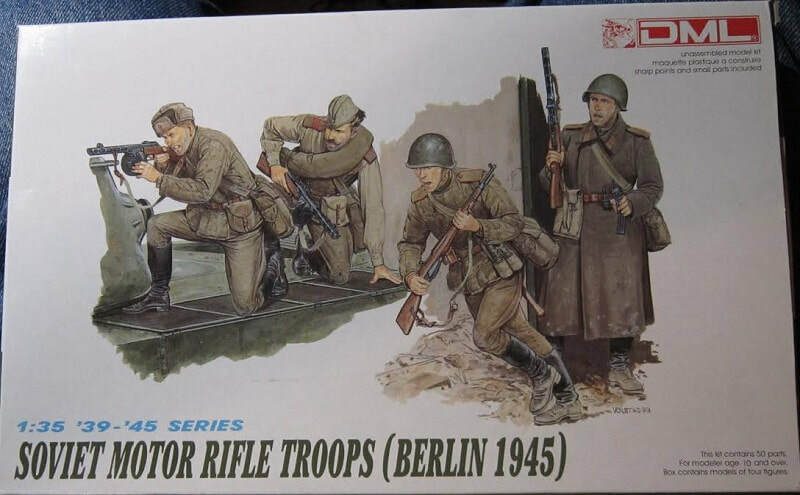 These are neatly molded figures in some nice poses. ​I bought my kit back in the 90's at my local hobby shop.